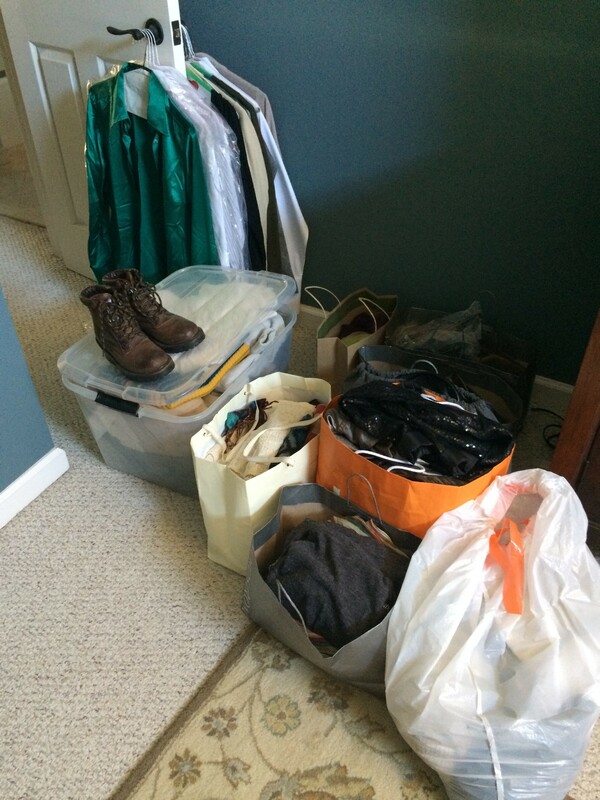 A recap of my mission on this organizing challenge: As you can imagine, my house is pretty organized. There is a place for everything and everything fits somewhere. And I keep on top of the maintenance and regularly reevaluate and purge what no longer fits into my life. But a few months ago, I really started thinking about what I own and I decided I’m ready for change in my life, ready for something new and I’m done with so much of what I have. I’m done thinking about how it used to fit into my life or that maybe it will again someday. So as a challenge to myself, I decided to do this work and document it for you so you could see how even an organizer struggles with the same things you do! Is this the post you’ve been waiting for???? It was certainly the project I was waiting for! I was both excited and apprehensive for this one. I needed to sort through my closet, the off-season clothes in storage as well as the clothes in different sizes that had been set aside. I should have taken more photos, of the closet, of the bins there and under my bed and I had two bins in the storage cubby. Sounds like a lot of clothes, I know. But the point is that all the clothes in my closet fit me, are season-appropriate and I wear them! And the rest were stored neatly away. 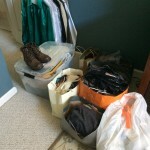 The photo above shows all the clothes that were for donation and some consignment. It probably doesn’t look like all that much, but it sure felt like it! I made some really big and challenging decisions because a lot of these clothes were from different periods of my life — when I dressed business casual or would travel to colder climates more frequently. Some I had been saving because I loved, but they were getting older and styles change. And of course, there are the fit issues. I don’t mind telling you, as many of us go through this, but my weight has fluctuated and I went up and up the last two years, but now I’m back down. Of course, I’m not down to the sizes I was in two – 15 years ago and that’s unlikely to happen again. I really only saved favorites, what I felt were classics and things in very good condition if they didn’t fit. And I think this practice is okay and I advocate this method for clients…store the clothes that may fit again, just be selective about it and they can’t be hanging in your closet. About 8 button-down shirts that are in great condition, very nice brands too. But I don’t wear them to work anymore. Lots of tops and sweaters that I didn’t wear last fall and are either too big or too small to wear this year. I decided I’m over it! And it’s really funny how a sweater that looked great on me two years ago, doesn’t fit well now even though I’m back to the same weight. I’ll quote one of my clients who was referring to how our figures change as we age, calling herself a “shape-shifter” and I have always thought that was funny. And true! Jeans,pants and skirts too — either they havent’ fit for awhile,don’t fit now and I’m tired of them being options to wear so they had to go. Winter Sweaters — Some very nice sweaters that I loved, but they were for going to the mountains in the summer, or when I’d travel to Chicago in the winter. I tend to wear more layers now, instead of such bulky sweaters. Plus, those sweaters take up a lot of space when you pack and to store. Sock Drawer — I tossed socks that I didn’t like and cut down the amount I have of certain styles that I just don’t need as much of anymore. I went through workout clothes, pajamas and “around the house” clothes and got rid of anything ill-fitting, uncomfortable or tired-looking. I find that people tend to keep a lot of these types of items and they are pretty lenient on the condition they’re in. But you’ll feel better if you’re dressed better. Prom and dressy dresses — Yes, I still have them! I admit that some I was saving for the idea of a keepsake because I loved them…but you can be sure that none of them fit and would be far from fitting. It’s too bad though. The two black prom dresses are something I would wear today if I could…and if I had somewhere to go 😉 They are both classic, long and elegant, not at all trendy. But fitting into them isn’t going to happen. And again, that shape-shifting thing as we age. There were other more recent dresses that I decided if I had an event to attend, I just would never choose those dresses today, so they had to go. Scarves — do you remember when we were wearing silk/silk-like scarves as belts? I had a lot from that time, most of them inexpensive accessories. I did keep some of the nice, beautiful ones as they still work for me, but all the others had to go. Coats — I have had quite a few coats over the years and some for 10-15 years! Because they were nice, mostly leather and in good condition, I kept them even though they didn’t fit. I have them in a bin and now some of them fit, but I can’t decide if they are my style anymore. These items are in limbo. SHOES!!!! — Man oh man did I get serious with the shoes! I used to work in an envirnoment where I wore heels and dressier flats. I aslo wore heels more on the weekends before my feet hurt all the time. I was saving them because I liked them, they were in good condition and you can’t go wrong with some of the classics or even the fun ones to spruce up an outfit. I still have quite a few pair, even ones that are rarely worn, but to part with a good 15-20 pair is a great start for now! Maybe that doesn’t sound like a lot, but considering that I still liked all of them, they’re in good condition and I could potentially wear them again “someday” it was great that I got rid of them as I hadn’t worn them in years. I didn’t even think about them until I looked at them during this process. After reading this, I’d love to hear what you’re going to do with your closet! Read back Day 1, Day 2, Day 3, Day 4, Day 5 and Day 6. "Take Care of Your Time, So Your Time Can Take Care of You"